The delicious Andhra cuisine, which is a combination of the South and Deccani, is reputedly the spiciest and hottest of all Indian cuisine. The cuisine is largely vegetarian, with only the coastal areas showing a marked preference for seafood. But it also has many non-vegetarian dishes which are spicy and unique in taste. The staple food, rice, is served with sambar, other lentil preparations along with vegetables, green chillies and ample spices. The spicy chutneys and pickles of Andhra, specially mango and shrimp, are a hot favorite all over the country. Traditionally, Andhra meal is served in banana leafs with people sitting down on mats or small raised wooden seats. Before serving a little water is sprinkled over the leaf. Rice is served with a little helping of ghee. Usually the meal includes nearly five types of dishes, but a typical one, has to have the famous hot pickles, chutneys, powders etc. The spiciness of the meal is neutralised using curd. 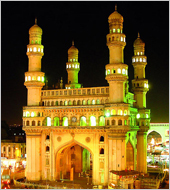 The capital Hyderabad also has a unique cuisine of their own very different from the traditional Andhra meal.